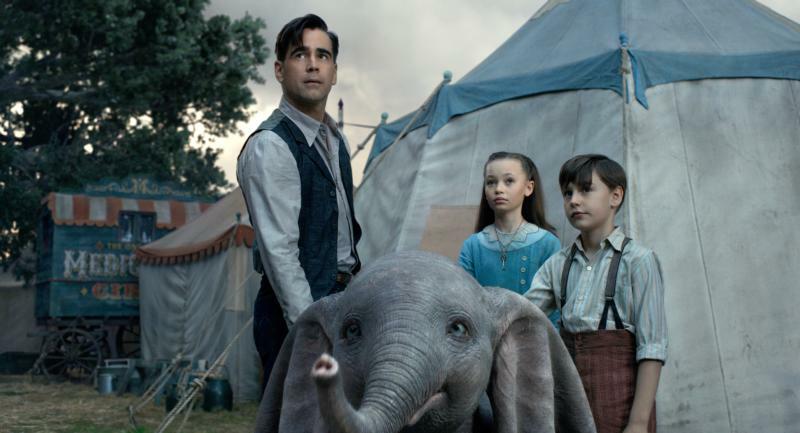 NEW YORK (CNS) — The sight of a cuddly baby elephant taking to the skies is clearly meant to send spirits soaring in “Dumbo” (Disney), director Tim Burton’s live-action reimagining of the 1941 animated classic. Holt’s two children, aspiring scientist Milly (Nico Parker) and preteen Joe (Finley Hobbins), can see beyond the apparent flaw. They feel an affinity with Dumbo, especially after his mother, having gone on the rampage in an effort to protect him, is sold back to her original owner. Their care for Dumbo is rewarded when they discover that his unusual auditory anatomy enables him to fly. Lessons about not judging by appearances as well as the example of Milly’s female empowerment as a would-be Marie Curie are wrapped up in these events. And Burton brings predictable visual flair to screenwriter Ehren Kruger’s story — Dreamland, for example is quite an eyeful. The film contains characters in danger and cruelty to animals. The Catholic News Service classification is A-II — adults and adolescents. The Motion Picture Association of America rating is PG — parental guidance suggested. Some material may not be suitable for children.